This study of Revelation emphasizes the joy Christians have in Christ, despite earthly suffering and pain. - Publisher Neither a commentary on the book of Revelation nor a devotional work -- though it offers aspects of both -- "Joy in Our Weakness is instead a theological and practical guide that ushers readers into the very presence of Christ and His Lordship over the powers of evil. Marva Dawn writes compassionately for those who suffer, for this book was born out of her own struggles with physical limitations and chronic illness, and it is intended to help the whole Church learn how to find Joy in every circumstance of life, especially in trials and sufferings. After outlining some important foundational principles in three introductory chapters, Dawn guides readers through the whole book of Revelation, pointing out the errors of those who try to calendarize the end of the world and instead delineating how The Revelation reveals Christ's Lordship, exposes the workings of the powers, and sustains those who suffer until evil is ultimately defeated. Now thoroughly revised for a wider readership, "Joy in Our Weakness highlights The Revelation's original purpose -- to comfort afflicted, suffering believers -- and spells out a biblically grounded theology of weakness, offering a rare gift to the Church today. A wealth of insight and encouragement truly awaits the readers of these pages. 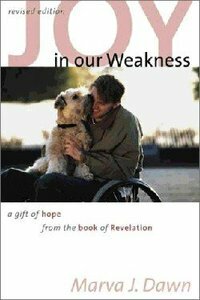 About "Joy in Our Weakness"
Neither a commentary on the book of Revelation nor a devotional work -- though it offers aspects of both -- "Joy in Our Weakness is instead a theological and practical guide that ushers readers into the very presence of Christ and His Lordship over the powers of evil. Marva Dawn writes compassionately for those who suffer, for this book was born out of her own struggles with physical limitations and chronic illness, and it is intended to help the whole Church learn how to find Joy in every circumstance of life, especially in trials and sufferings. After outlining some important foundational principles in three introductory chapters, Dawn guides readers through the whole book of Revelation, pointing out the errors of those who try to calendarize the end of the world and instead delineating how The Revelation reveals Christ's Lordship, exposes the workings of the powers, and sustains those who suffer until evil is ultimately defeated. Now thoroughly revised for a wider readership, "Joy in Our Weakness highlights The Revelation's original purpose -- to comfort afflicted, suffering believers -- and spells out a biblically grounded theology of weakness, offering a rare gift to the Church today. A wealth of insight and encouragement truly awaits the readers of these pages. Marva J. Dawn (Ph.D., University of Notre Dame) serves as theologian/educator under Christians Equipped for Ministry of Vancouver, Washington and as a Teaching Fellow, Spiritual Theology, Regent College, Vancouver. Her books Powers, Weakness, and the Tabernacling of God and The Unnecessary Pastor with Eugene Peterson both received Christianity Today's book award in the category of the Church/Pastoral Leadership. Her other books has been quite provocative with regard to contemporary trends in worship and society such as Reaching Out Without Dumbing Down; Is It A Lost Cause? and A Royal Waste of time. Most recently she has authored Being Well When We're Ill: Wholeness and Hope in Spite of Infirmity and In the Beginning, GOD: Creation, Culture, and the Spiritual Life.